I came here and missed my flight - which was my own fault - but the staff were extremely unhelpful had a poor grasp of English and generally made my panic worse. The airport itself is confusing I wasn't sure where to find my airline's representative and checking luggage was a nightmare. The food options seem to be Starbucks and a French bakery although that could just be the terminal I was in. I ended up booking another flight from CDG and taking a taxi from Orly to there. Basically if you have the choice to go here or CDG I would suggest CDG hands down. Departed from this airport today. The level of amenities on the public side of the airport was good however this was in stark contrast to what was available air-side where there wasn't even enough seats for passengers in the lounge area. This would not be a good airport to be in if there were significant flight delays or cancellations. The airport's layout is haphazard and insufficient signage made finding the online check-in confirmation difficult. Staff were unhelpful and rude and the queue waiting time for passport control was one of the longest I have experienced. 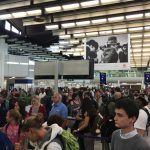 There were two queues and two desks open for passport control. Often delays were created because security clearance was taking place directly behind leading to bottlenecks and people waited to pass from one stage to the next. It was clear it was the result of very poor layout which could be quite easily addressed if the design was modernised. Prior to the flight the boarding gate was changed by way of an announcement however the electronic boards were not updated. Similarly the boards were not updated to say the flight was boarding. As a result of all of these factors the flight was delayed and the cabin crew very forced to apologise to staff for the airports inefficiencies. In future I will not be flying from this airport again it lacks the efficiency to process passengers effectively. Lovely quaint little airport a little muddled by the checking in system. However the club lounge is run by staff full of their own self importance. My husband and I are both members of the Priority Pass and were refused admittance to this lounge even though Orly is on the Priority Pass list of included lounges. What is the point of having a private Lounge if the staff running it do not know their job. Orly Airport is of the 1980's. If you only have hand luggage then you are forced to stand in line at the normal check-in as there are no self-check-ins. The queues are long. Managers need to update their airport. Take a look at Copenhagen Airport for inspiration. Close to Paris but is a lousy airport. I spent two hours there on a Shenghen area flight and there is no restaurant inside the departure lounges (and no sign outside indicating this) but only two bars serving poor food and drinks at extortionate prices - €3.95 for a litre bottle of water is a joke as is €5.50 for a sandwich. Bring your own food drink from the public fountain sit tight and wait. The staff managing boarding procedures were very impolite spoke to everyone in French and generally were pretty useless and arrogant but it might have been a bad day. 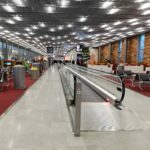 Some travellers' tips if you need to spend time in Paris Orly Airport. Free water dispenser inside Tourist Information counter at Paris Orly SUD terminal don't buy from vending machine. Free power point and free wifi in McDonald's at Hall A level 1 open until 10pm. Have not had a good impression on Orly. Inbound and outbound flights were via terminal Ouest (West) which is cramped dated and confusing. Check-in halls are a mess and lines are not well organized which makes passengers disorientated. Few options for shopping and dining once inside security zone. Be careful that some services are restricted to the South terminal such as the banking service for tax refund in cash. As this airport lacks an efficient mobility system between terminals allow yourself at least an extra hour should you need to go back and forth safe. Very strange airport. 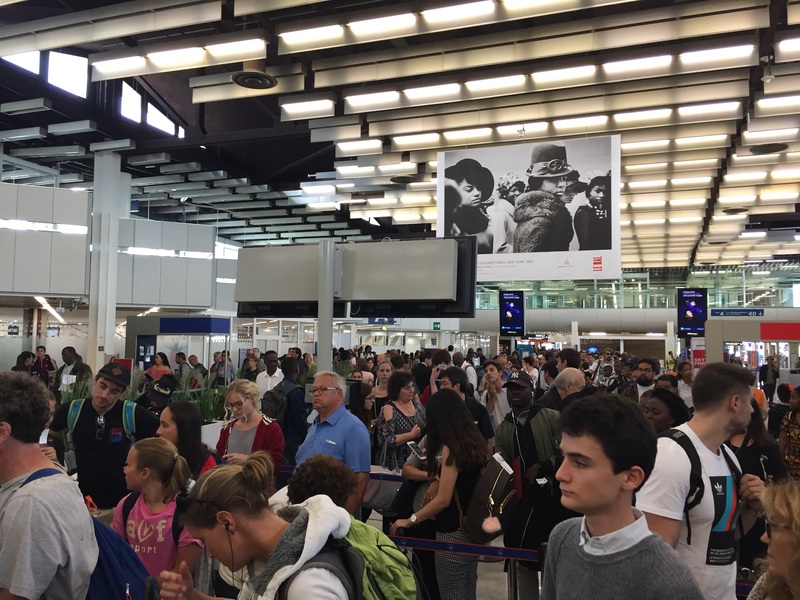 Upon arrival from Berlin on Bastille Day with Easyjet we disembarked at a gate located in Orly Ouest only to proceed walking almost 1km to Orly Sud (which is the designated terminal for Easyjet operations in Orly). Furthermore for some reason or another and I'm not sure whether it was because of Bastille Day or the distance between Orly Sud and Ouest baggage took nearly 35 minutes to get to all the passengers assembled in the baggage claim area. Ridiculous standard of service especially when dealing with a intra-Schengen flight. I often use "Orly-Ouest" terminal for French domestic flights and my experience is quite mixed depending on which boarding halls I use. Hall 1 is mainly used for medium-sized destinations (with turboprop and Fokker aircraft) and is my preferred one - security checks are usually quick boarding area is bright with sufficient seating areas. 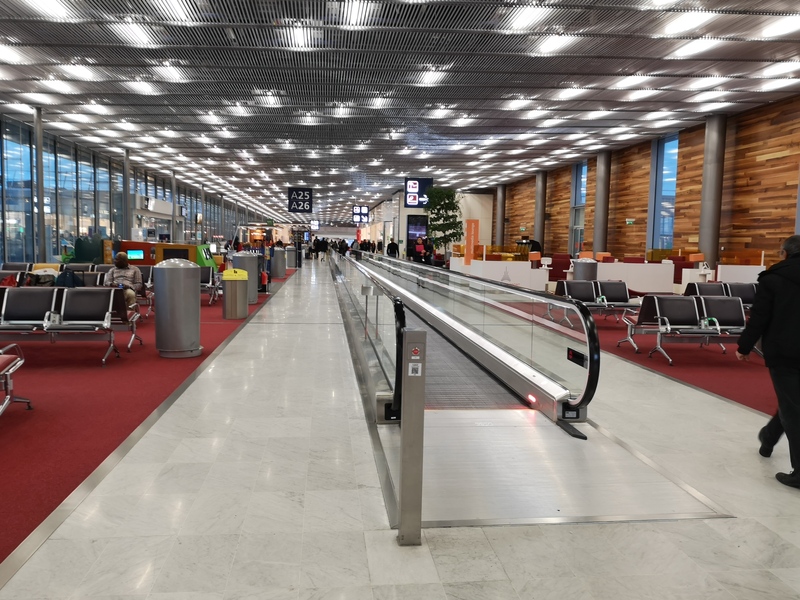 Hall 2 is dedicated to LaNavette shuttle flights to Bordeaux Toulouse Marseille and Nice - at peak hours waiting time at security can be very long and the boarding area is cramped. 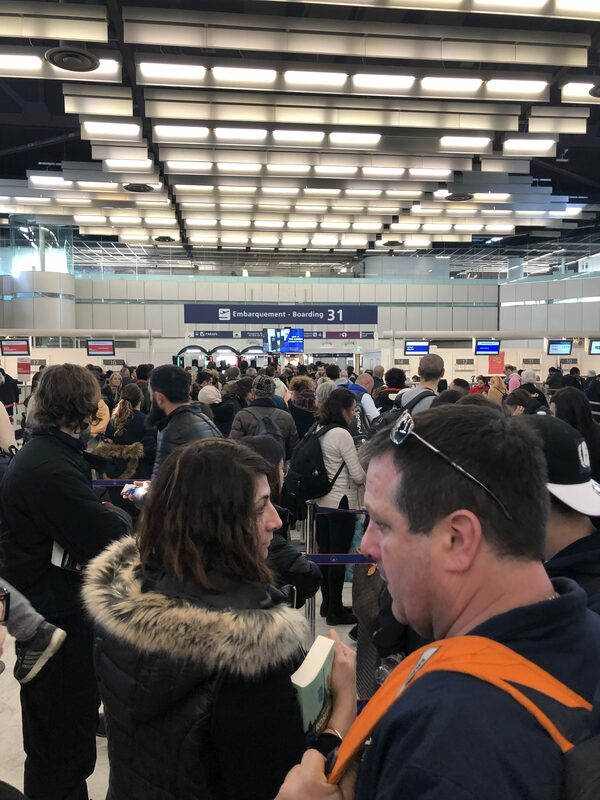 Furthermore as LaNavette flights run every hour or even every 30 minutes it can become confusing and difficult to locate the right boarding gate! Hall 3 uses only departure gate 30 for domestic flights - no need to rush through security as tha gate has only toilets and no other facilities. Hall 4 is used rather for tourist destinations with larger aircraft (A320/A321 to Biarritz Toulon and Corsica) - the boarding area gets crowded rather rapidly and the small bar has rip-off prices. ORY is much closer to downtown Paris than CDG but is unfortunately missing a fast and reliable train connection. Avoid the Air France coaches and the OrlyVal train which charge rip-off prices - around €10 one-way. The OrlyBus shuttle is cheaper but is always overcrowded. My preferred alternative is to use the RER C suburb train: first catch a shuttle bus from the airport to the train station "Pont de Rungis - Aeroport Orly"; from there a RER train run every 15-30 minutes to downtown Paris. The whole trip costs €680 one-way and lasts around 45 mins. This is a retro airport hence interesting for anyone who still dreams of the 1970s! 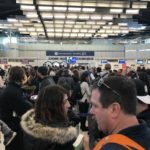 However be warned that if you are taking one of the early morning discount airline flights because you will encounter almost unimaginably long security check lines. The queue I entered ran almost the entire length of the south terminal (100+ meters)! The system only seems to work because once your flight is deemed "prioritaire" (ie. already boarding) you are allowed by officials to cut in to the front of the line. However until your flight gets this status change all you can do is stand at the back. I suggest checking in at least 2 hours before departure even for domestic flights.